Flexsteel Marine Furniture and Flexsteel RV Furniture has been our primary RV Furniture supplier since 1972 and production Marine Furniture supplier since 1982. Their name is synonymous with high quality and industry leading design. Flexsteel has been manufacturing quality furniture since 1893 and is the nation's number one manufacturer of RV Furniture. They are also a major supplier of Marine Furniture to many of today's leading yacht manufacturers. Villa International RV Furniture - founded over 50 years ago, they are a company known for high quality Custom RV Furniture of distinction. 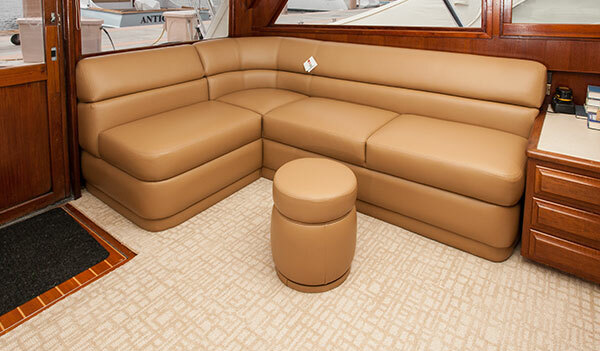 Villa adds their custom tailored touch to many of our Custom Marine Furniture designs. 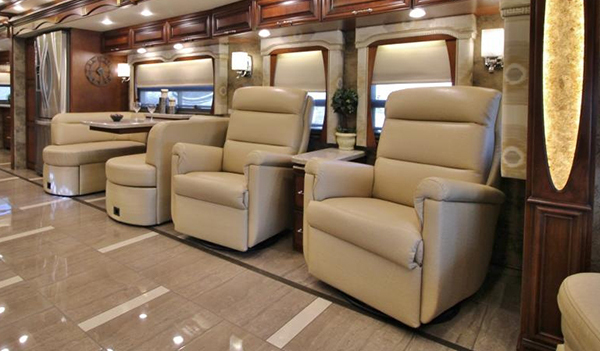 Villa RV Furniture is found in many of today's high end coaches. Mariner Yacht Furniture -Is our private line and a Marine and Yacht Furniture manufacturing team that was established in 1999. This team is comprised of a select group of very talented and experienced marine furniture designers and craftsman that are responsible for our ever popular; Elite, Bimini and COMPanion line of high quality Marine Storage Sectionals, Marine Sofas, Barrel Chairs and gorgeous Hi Lo Tables. This specialized team was established to keep pace with the ever changing needs and demands of the Marine Furniture industry. Our Goal is; a top quality product that always exceeds your expectations, a wide selection of styles to fit any possible decor, size, price range or configuration with turnaround time and customer satisfaction second to none. Lafer Recliners - Lafer's patented reclining system is ergonomic and space saving providing you the ultimate luxury-style and comfort. These supreme quality all leather Euro recliners with their amazing retractable footrest and adjustable headrest are typically found in many of today's high end coaches. Lambright Comfort Chairs - One of our biggest sellers for good reason. These Amish made, innovative and high quality wall hugger recliners/incliners have it all; extreme comfort, a variety of trend setting styles and fabrics and sizes to fit all body shapes, including some compact recliners at only 25” wide. Lambright also offers a design selection of RV Loveseats, Sofas and RV Sofa Beds. Our selection of these RV Furniture and Boat Furniture manufacturers is directly related to the quality and comfort of their products, and is why we chose to partner with them. At Glastop, we listen closely to your needs, ideas and budget constraints; then, using our 44 plus years of first hand product and application knowledge, we help guide you through the sometimes complex product selection process. As a result of our attention to detail, we are able to offer you, our Yacht Furniture and RV Furniture customers, a 100% Money Back Guarantee (inc. shipping both ways) if you are not completely satisfied with your purchase. Our goal is always the same: to provide the best possible Marine and RV Furniture products available for your application at the best possible price while providing customer satisfaction second to none.